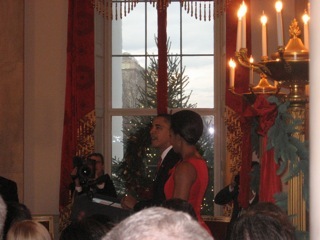 [caption id="attachment_879" align="alignright" width="300" caption="The Obamas welcoming guests to the White House."] [/caption] By Sally Greenberg, NCL Executive Director On Tuesday afternoon, I took the 7-minute stroll over to the White House from our offices in downtown Washington to be part of a group that received “exclusive” nontransferable invitation to the White House to celebrate this festive season and enjoy the White House’s beautiful and diverse rooms and halls filled with holiday decorations. Indeed, during a "Meet the Press" interview in December 2008, President-elect Obama said, "Part of what we want to do is to open up the White House and remind people this is the people's house." Since the election of Mr. Obama last year, he has made good on that pledge. These days, the White House is a very different place—a welcoming place—for those of us in the nonprofit and public interest world. We are not the well-heeled lobbyists who make large campaign contributions and yet, though they may not always take our advice, members of the White House staff have invited us into their offices often to talk and to share our views. The National Consumers League and our consumer and labor colleagues have also been invited to the President’s speeches on mortgage fraud and the overhaul of our financial markets, been a part of bill signings for the credit card and mortgage reform bills. 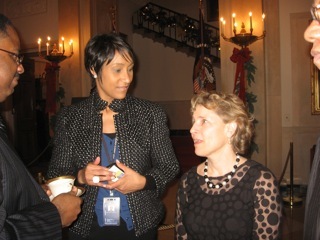 But yesterday was a little different because we weren’t there to work—we were there to enjoy the beauty of the “people’s house.” [caption id="attachment_880" align="alignleft" width="300" caption="White House Social Secretary Desiree Rogers, left, with Sally Greenberg"] [/caption] Finding colleagues from across the public interest world at this lovely White House gathering, we spent an hour walking through the various rooms in the house—including one filled with portraits of first ladies, another painted a very bright red with beautiful hand carved chairs and tables. White House staff was there greeting us—high level staff including Valerie Jarrett, the president’s close advisor and longtime friend. The food was delicious – blini, little Russian pancakes, sat next to potato latkes or pancakes, a traditional Hanukkah offering. There was a table with the best egg nog you’ve ever tasted. Of course, when the First Couple finally arrived, I was in the wrong room. A roar went up, and the crowd quickly moved toward the President and Michelle. I didn’t have a prayer of seeing them—I’m far too short—but I did ask the very tallest reveler to take a photo for me, and it’s included here. I caught a few glimpses of the First Couple when some taller visitors took pity on me and brought me up to the cordon where we were all shaking hands. Alas, by then the First Couple were moving toward the door. Nevertheless, I was struck by how much fun the President was having – it seemed remarkable that in the midst of all the many issues he has on his plate, he can lighten up and laugh and enjoy his guests. Out we went just after 5 pm into the darkening streets of Washington, grateful that consumers, civil rights, environmental, and disability groups have the chance to share this beautiful place with the new President, our public interest colleagues, and the White House staff.